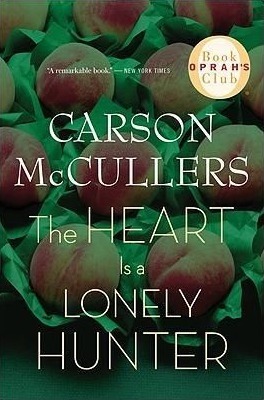 After finishing my Nonfiction November, I returned to fiction, starting with a 1940 classic, The Heart is a Lonely Hunter by Carson McCullers, for a read-along hosted by the Book Cougars podcast, created by two women who've been to the same two Booktopias that I went to. I enjoyed this classic southern novel that centers on a small Georgia town in the late 1930's. The novel focuses in on five very different characters in the town. John Singer is a deaf-mute who is heart-broken when his best friend and soul mate (and a fellow deaf-mute who knows sign language) moves away. Singer becomes a focal point for the other four major characters, who each come to talk to him in his rented room, finding him a very good listener (perhaps because he can't talk back!). Biff Brannon runs the local cafe with his wife and often stands silently at the front counter, observing his customers eating, drinking, and chatting. One of those customers is Jake Blount, who is new to town. Jake gets a job at the local carnival running and maintaining the rides, but his true passion is labor organization, and he is often heard ranting about the unfairness workers are subjected to and quoting Marx. Twelve-year old Mick Kelly is also a frequent visitor to the cafe during her long, nighttime walks around town. Her parents own the boarding house where John Singer lives, and Mick dreams of a life filled with music. Finally, Dr. Copeland is the town's only Black doctor, a well-educated man who has devoted his life to the never-ending job of trying to keep the Black community healthy. He shares many of Jake's philosophies, but his focus is on the need for his people to rise up and overcome their inequities. His daughter, Portia, works for the Kellys. In this small town where everyone is connected, these four people routinely visit Singer to tell him of their problems, hopes, and dreams, while he listens silently. The reader gets to know the characters not only through their actions but also through their long discussions with the ever-patient Singer. As you might have guessed from the title of the book, all of them - including Singer - are terribly lonely, feeling isolated and alone in the world and thinking no one else can understand his or her thoughts and feelings. My favorite parts of the novel were those about Mick, who was a very likeable young girl - I was rooting for her! In addition to delving into each of their individual psyches, the novel also draws a picture of a southern town in the late 1930's, with most people struggling due to the Depression, racial tensions splitting the town, and hints of WWII to come. Some parts of the novel drag a bit, especially when Jake or Dr. Copeland get into one of their rants, but I mostly enjoyed it overall. It's often a very sad story, and there aren't any happy endings for any of the characters, but it is a compelling and moving portrait of a community in that time and place. If you have also read The Heart is a Lonely Hunter, check out The Book Cougars' discussion of the novel for their readalong. You can also join in their discussion of the novel in their Goodreads group.